The Fusion Roof Anchor Post is a versatile single-point anchor that adapts to a wide range of roof designs, including standing seam, membrane, metal sheathing, concrete and wood. 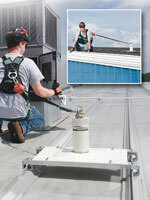 It protects workers by maintaining a secure connection to the structure in the event of a fall, and does not require roof penetration. The post meets all applicable industry standards.